After some computer issues, thanks to a certain internet company that will remain unnamed, I finally get to review this interesting beverage. Ambrosia Beverage group founded in 2010 is captivating on the newest segment in the beverage industry. Relaxation drinks are picking up popularity as the complete opposite to energy drinks. While many relaxation drinks use roots and floral ingredients to promote relaxation, many now use a more potent supplement of melatonin. Melatonin is a natural occurring hormone in humans that affects the sleep and wake cycles. It has been used as a supplement for people with jet lag or insomnia. This drink is quite tasty. Lightly carbonated it makes a great sipping drink when you need a little helping settling in. The light sweet strawberry is punched with tropical notes from the mango, a very appropriate flavor for the function. The color pours a beautiful shade of bright pink and the smell is very tropical. The small can size at 250 ml is over what you can bring through security. But they may be available for purchase in airport shops on beverage carts on your next trip. It tried the drink last night since I couldn’t get to sleep and it really helped to settle me after just a little bit. 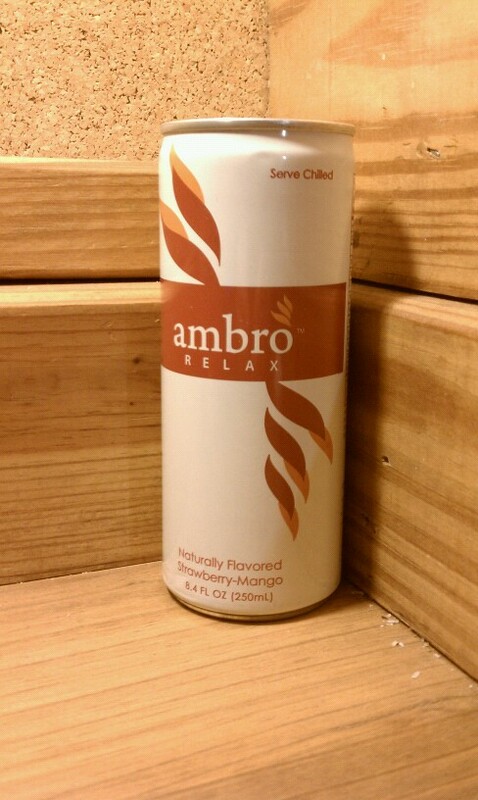 Check out http://www.ambrorelax.com if you need a little help relaxing. Look for it in C-stores, hotels, airports, airline beverage carts, and spas the next time you’re out.